This example demonstrates how to measure sound pressure levels of octave frequency bands. A user interface (UI) enables you to experiment with various parameters while the measurement is displayed. Many applications involving acoustic measurements must take into account the non-linear characteristics of the human auditory system. For that reason, sound levels are generally reported in decibels (dB) and on a frequency scale that increases logarithmically. Frequency weighting adjusts levels to take into account the ear's frequency-dependent sensitivity. A-weighting is the most common, as it cuts low and high frequencies similarly to the auditory system for "normal" levels. C-weighting is an alternative for measuring very loud sounds, as it mimics the human ear's flatter response at level over 100 dB. This example uses the splMeter System object to measure sound pressure levels (SPL). You can measure sound pressure levels of audio files or perform live SPL measurements with a microphone. You can specify the weighting filter (Z/A/C) and frequency bandwidth used for the measurements. 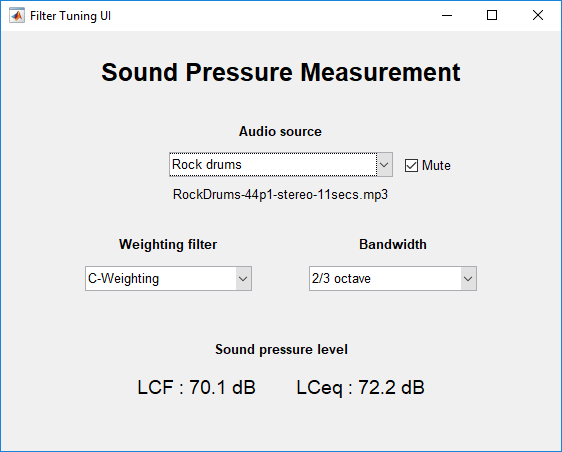 For more information on the weighting filters, see the Audio Weighting Filters example. 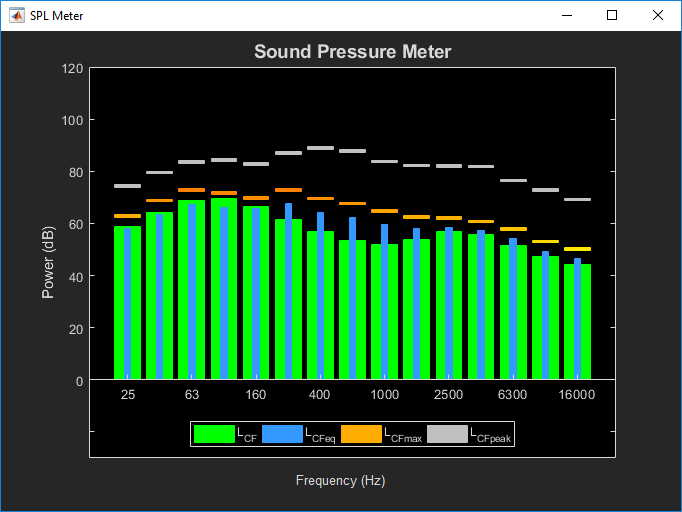 soundPressureMeasurementExampleApp loads the SPL meter user interface (shown below). The demonstration begins with pink noise, which measures relatively flat on the octave frequency scale. You can experiment with different audio sources, frequency weightings, and bandwidths. Execute soundPressureMeasurementExampleApp to run the demonstration and display the measurements.